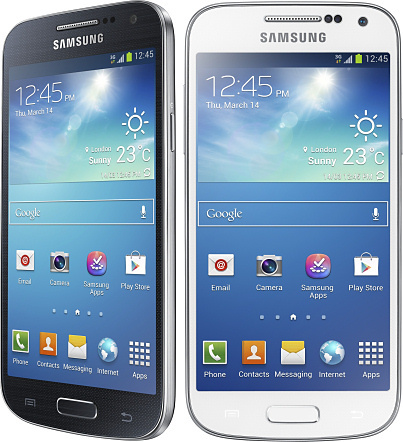 The Samsung Galaxy S4 is a superlative smartphone, and is easily on of the very best on the market. One drawback is that it is also a very large smartphone.. so a more compact version may well have some market appeal for those customers who are put off by the large size of the S4 and want something more compact. So, you might expect the Samsung Galaxy S4 Mini to be a Galaxy S4 device with a smaller screen, but it isn't. Like the disappointing Galaxy S III Mini before it, the S4 Mini is a completely different handset which really only shares with the S4 the things that every other Samsung Android smartphone does. The most obvious difference is the screen, dropping from the 5.0" panel in the S4 to a more pocket-friendly 4.3" display on the Mini. However, the Mini's pixel count is just one quarter of that on the S4 with a much less sharp display resolution. But there's a lot more than just the display - inside the processor has been downgraded from a 1.9GHz quad-core CPU to a 1.7GHz dual-core one, RAM is down from 2GB to 1.5GB, internal storage is just 8GB compared with a minimum of 16GB of the S4 and the Mini's primary camera is an 8 megapixel one compared to 13 on the S4. There are a few similarities - both the S4 and some models of S4 Mini support LTE and NFC, have GLONASS support as well as GPS and they both run Android 4.2.2. All the other features you'd find on the S4 Mini are basically the same thing that every other Android handset has. There are a few different versions available, one version of the S4 Mini will support various LTE bands, there will be a non-4G HSPA+ version and also an S4 Mini with dual-SIM capabilities. At 125 x 61 x 8.9mm and weighs 108 grams, the Mini weighs about 25% less and has a 20% smaller footprint than the S4. The Galaxy S4 Mini is a typical Samsung device to look at, a combination of smart but somewhat uninspiring design. If you buy one of these assuming that it really is a "mini" version of the S4 then you are likely to be very disappointed. However, if you are looking for a decent midrange smartphone then the S4 Mini looks like a reasonable choice, but then are a stack of other very similar Android handsets on the market too. Samsung didn't say exactly when the Galaxy S4 Mini will be available, but we'd expect it to be available in the shops before you can say "cynical marketing exercise". No guidance on pricing was given, but our guess is that the S4 Mini will retail for about €300 to €350 SIM-free.